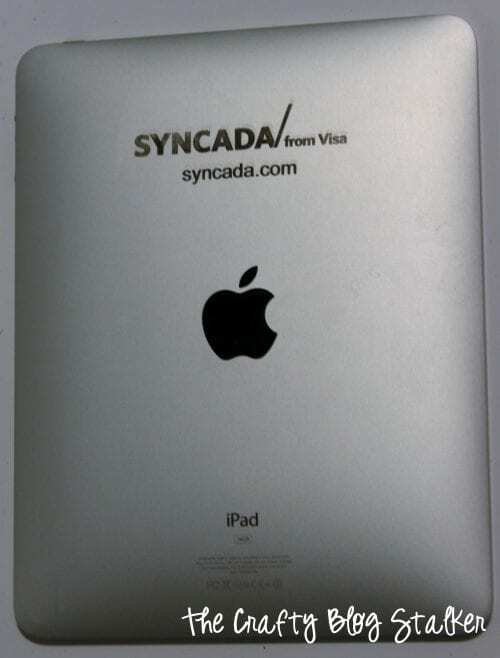 Make a personalized iPad decal out of vinyl and make it your own by giving it style. An easy DIY craft tutorial idea for your Silhouette Cameo. Recently, my husband went to a conference for work. I was so excited when he called me on the last day and told me that he won an iPad from one of the vendors! He told me not to get any ideas because it was his, but within a week I was the one taking it to work every day. I am so glad my sweet hubby puts up with me! The vendor engraved their information on the back. It’s a great marketing strategy, and especially since I got it for free, I really can’t complain. So I decided I would cover it up with a fun vinyl decal! Do you have a favorite animal? Mine is the owl. 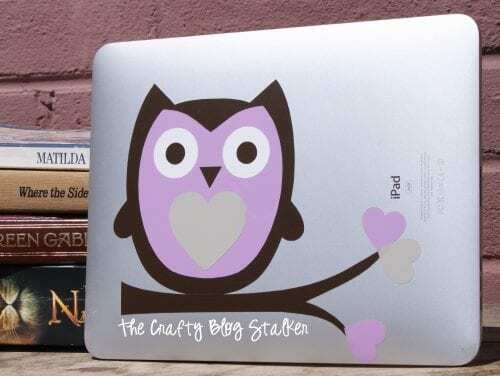 I found a really cute Branch Owl file from Lori Whitlock on the Silhouette site and knew it would be perfect to cover the logo. I cut out the different layers of the owl as the site instructed and then applied over the engraved logo on the back of the iPad. Now instead of people asking me about a company, I know nothing about I am getting compliments on my cute owl iPad decal. I love it! What vinyl decal would you put on the back of your device? Share and leave a comment below and let us know how you do it differently. SAVE HOW TO MAKE YOUR OWN IPAD VINYL DECAL TO YOUR FAVORITE DIY PINTEREST BOARD! That’s very cute! Thanks for sharing. I love that! Isn’t the Silhouette THE BEST THING EVER? That owl is too cute! Hi! I’m your newest follower and co-host of this month’s blog hop. Thanks so much for joining in on the fun 🙂 I’m looking forward to getting you know you better! That’s a fun idea. And owls are so in right now. What a cutie… Love Owls. They are such an intriguing specie. Too cute! Thanks for sharing at Terrific Tuesdays. This is so cute! I wish I had a Silhouette. I love the Owl. What an adorable solution to your problem. I love owls too. Thanks for sharing at our party this week. How cute!! Thanks for linking to Things I’ve Done Thursday! Adorable! I was pretty jealous of you and your Ipad and Snap Conference – I really need to get me one and decorate it all cute like you have. I love the decal. Both purple and owls are favorites of mine. We just got an iPad. Do you blog on it? I had to get a keyboard because it was driving me crazy. Also, how do you edit your photoes with it? Sorry. Very new to this technology. Thanks so much for sharing at Whimsy Wednesdays. I am so glad that you like the decal. It was a lot of fun to make and I really like how it turned out. I love my iPad and I will write draft blog posts (I have the keyboard as well) but I don’t add the pictures to my posts from iPad. I will finish my posts on my pc and add the pictures there. I wish I had an awesome answer to your question, but I keep all my pictures on my pc so it is easier for me to do that there. Very nice outcome, like a pro! That is so cute! I love how it turned out. Such a fun idea. Thanks for sharing!